"I love making homemade soups in the fall, and this is my new favorite. Serve with crusty rolls." Preheat the oven to 425 degrees F (220 degrees C). In a large bowl, toss cauliflower pieces with olive oil, garlic and shallots. Spread out in a roasting pan or baking sheet with sides. Roast in the preheated oven until toasted and tender, about 30 minutes. When the cauliflower is done, transfer to a soup pot and pour in the chicken broth and water. Season with thyme and the bay leaf and bring to a boil. Cook over medium heat for 30 minutes. Remove and discard the bay leaf. Puree the soup in the pot using an immersion blender, or transfer to a blender and puree in batches, then return to the pot. Stir in the cream and season with salt and pepper. Heat through before serving but do not boil. I tryed using puree potatoes instead of cream, cup for cup. Instead of having a fatting soup I felt guilty about later, I had one that everyone including my lactose intolorent grandmother loved. This was exceptional! I used potatoes in it as another reviewer had suggested and added a small amount of cream at the end. Delicious. 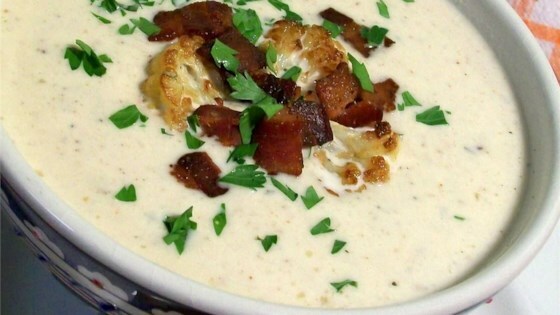 Great flavor, but be careful not to burn the cauliflower. Had to start all over again, but it was worth it!